Last night, Jenny and I experienced a fantastic evening of Christmas Worship! We joined my friend and Pastor Carlos Guevara for Noche Divina, with Sugar Hill Espanol. I can’t think of a greater Christmas gift than the gift of seeing Sugar Hill Espanol flourishing under the leadership of Pastor Carlos. He and his wife, Jessica joined our team about 2 1/2 years ago. Carlos was a web designer and had recently served Dr. Charles Stanley’s In Touch Ministries. But following a lay-off, Carlos started his own design firm. It was a cold call email for web services (that I would normally delete) that the Divine used to prompt my heart. I am so grateful that I heard the Divine and answered His prompting. You see – the Divine had others plans. I asked Beth, my unbelievably gifted assistant to coordinate a time for Carlos and I to meet over a cup of Starbuck’s coffee. Within 20 minutes of meeting him, I was asking Carlos if he’d ever considered the pastorate as a vocation. Then I learned that Carlos had a worship team helping a small church plant in Lawrenceville. His response was an emphatic NO! I’m was not sure what the Lord had in store for both of us at that time…BUT! The Divine had some significant plans in store for Sugar Hill Church and for the Guevara’s. Shortly thereafter, Carlos joined our team as a bivocational pastor of the yet to be created Sugar Hill Espanol. With nothing more than a heart filled with obedience and faith, Carlos and Jessica launched Sugar Hill Espanol with a handful of faithful folks. O my! 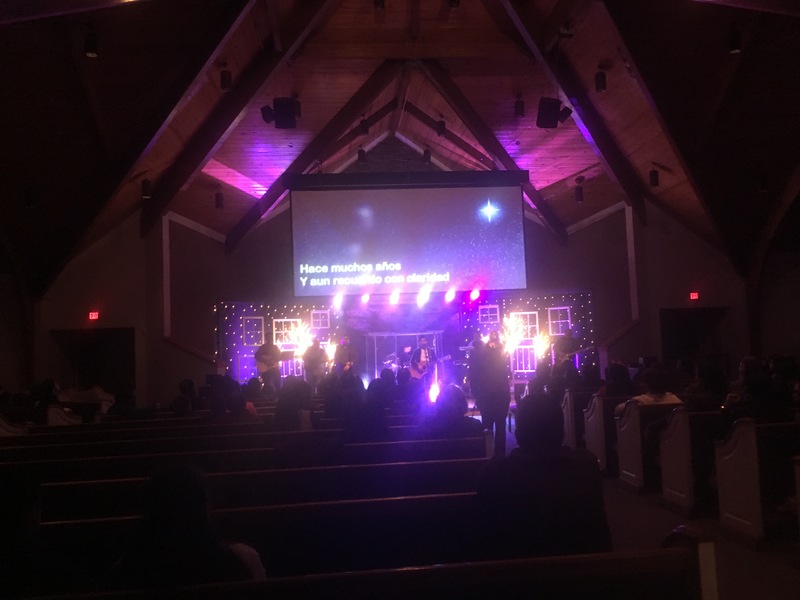 I had no idea that one evening in December 2016, I would be enjoying an evening of Christmas Worship with about 300 wonderful Sugar Hill Espanol folks in our chapel. It was one of the most worshipful experiences of my life. At one point, Carlos was praying (in spanish) and I had no idea what he was saying to the Lord, but there Jenny and I were…weeping with joy over all God had done in this ministry. I was reminded of God’s faithfulness, His provision, and His calling for us to join Him in His redemptive plan for mankind. I was overcome with joy as we watched God’s diverse creation singing, praising, praying and trusting. The story is a reminder to all of us that when we are sensitive and responsive to the Divine’s prompting in our heart, we join Him in changing the world with His story and His Gospel. If you’ve ever wondered if the Divine has a plan for your life, just look at Carlos and Jessica, and you will find the answer. A gigantic YES! The Divine has a plan for you to prosper for His glory and your good. What has the Divine called you to on this Monday? If you’re not sure what that is, simply ask Him. Then hush, listen and answer with YES Lord…whatever you desire. And watch what He might do in you, for you, and through you. You see, He is always good and you are always loved!